Noah’s Ark leads to the manger. Both are symbols of salvation. Both serve to hold and protect. Both are eventually left behind. The big difference lies in the finality of the manger. It holds and protects the Son of God himself. No greater gift will ever be entrusted to human hands. Noah’s Ark protects human life; the manger offers God’s life. From Ark to Manger, God’s love intensifies and points out that true life is in God. We sometimes forget about the way of salvation from Ark to Manger. The Suffering Servant (Ecce Homo) is sum and substance of Truth amid distraction. Two different sets of wooden figures, created by artists Jerry Krider and Gunther Keil. The nativity at the top was created by Jerry Krider, and can depict the Annunciation, Mary and Joseph's journey to Bethlehem, the Archangel showing the star of Bethlehem to the shepherds, a traditional manger scene, the adoration of the three wise men, and the flight into Egypt. Handcrafted from eight different American hardwoods. Everything stores inside the stable with its folding doors. 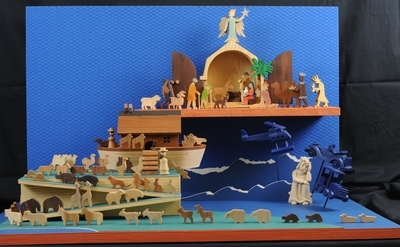 The lower-level depicts figures from the biblical story of Noah's Ark, and was created by Gunther Keil. A variety of woods were used to create Noah, his wife, and the animals. Exhibition label originally written by Fr. Johann G. Roten, S.M. for exhibit held at Roesch Library, University of Dayton.